I want to start off by saying I have a low pain tolerance. When I got the tattoo I cried hysterically, I'm pretty sure I also screamed. It sounded like I was being tortured. When I got my belly button pierced I fainted. I got this tattoo when I was 18 years old. 10 years ago. I honestly wish I never got any tattoos. I have two, one is a sister tattoo (a teeny wave on my wrist, yes I cried when I got that too) so that's staying but if I could go back in time I would have tried to talk my sisters out of it. 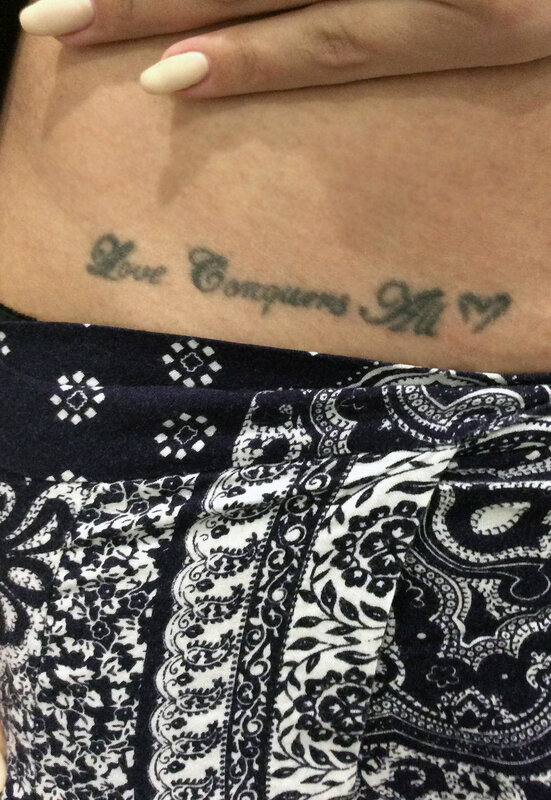 So here I am, now an adult with a "Love Conquers All" tattoo on my hip. Great quote, but writing it in a journal could've sufficed instead of marking myself with it. I knew that LaserAway, the place I have been getting my laser hair removal with for over two years offered Tattoo removal so I booked an appointment. I started to do research online about tattoo removal and the horror began. I read blogs about how it was the worst pain some people have experienced in their life. One girl wrote in her blog that it was worse than giving birth! Another person said it was way worse than getting the original tattoo done! Then came the photos, stomach churning photos of blistered and bubbling tattoos. That night I couldn't fall asleep I was tossing and turning and thinking about how much this was going to hurt. Did I want to go through all of the pain? I didn't hate the tattoo, I just didn't want it anymore. I started to think, what if I do it and then I end up with a nasty scar and a tattoo. I ended up canceling my appointment the first time. A couple weeks later I got the courage to book another appointment thanks to the nurse who did my laser hair removal session. She looked at my small hip tattoo and nonchalantly said it would take less than a minute and it wouldn't be that painful. Finally, for the moment we have all been waiting for. The day I had my first session done (three days ago) I was planning to live-stream the process but I changed my mind right before. I didn't want to scream and cry hysterically live on Periscope and terrorize the viewers. The nurse reassured me that she has never experienced someone crying during this procedure. That was reassuring a bit but I told her that I will probably be the first. She put some numbing cream on the tattoo and walked out of the room for 30 minutes to let the cream do its work. The process took about a minute and thats only because I asked her to give me breaks in between each zap. Guess what? I did not shed a tear! It wasn't that bad at all and it certainly was not worse than getting it done and if this is worse than having children I'll have 4. It hurt, but it went away almost instantly. Once the procedure was done it felt like you got burned hours ago and it felt uncomfortable but completely bearable. That night I slept on my belly and was completely fine. The next day it was almost completely healed. No blistering or bubbling. Today is my third day and I still have it covered with aquaphor and saran wrap just to be extra safe but I know tomorrow I will take it all off. I'll take a photo then to show you. All and all I am SO glad I went through with it. Take note that this is my experience with LaserAway So if you get it done with someone else and it hurts like hell and you are hysterically crying I'm really sorry about that. I'm sure the machine they use is a big part of my experience.